Magento is a great eCommerce platform, it comes with so many built in features some of which you will probably never use. However one feature that we hear a lot of complain about is the lack of possibility to have a Shopping Cart Promotion Rule that targets the products custom options. 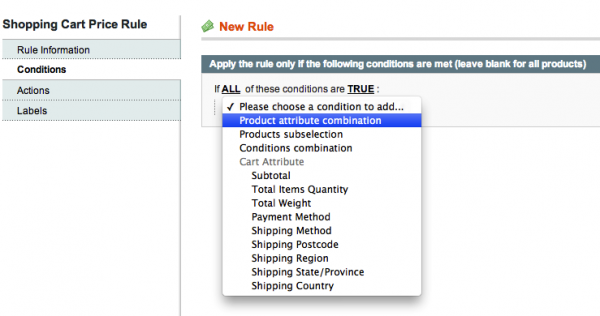 If you login to Magento admin, and go to Promotions > Shopping Cart Price Rules > Add New Rule, then click on the Conditions tab of the Shopping Cart Price Rule edit screen you will see a screen like the one shown below. As you can see on that screen, there is no mention of products custom options, only its attributes. In this article I’m gonna show you a nice little, cheap trick on how you can achieve the effect of having Shopping Cart Promotion Rule for Product with Custom Options. It will require a few lines of code to add and a little tiny bit of “manual calculation”. We will extract the code into our special little Inchoo_QuoteItemRule extension. Before we start writing the code, lets first explain what “Quote” has to do with “Custom Options”. Imagine we have a product product with SKU assigned “test_no2”. That product has two custom options (Color & size) and every option value has its SKU assigned as well like those shown on the image below. 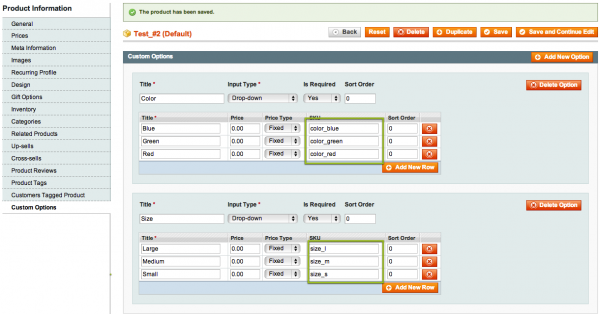 product main SKU + “-” + first custom option SKU + “-” + second custom option SKU + “-” + … nth custom option SKU. So the idea is that we actually create a rule condition that would allow us to have a Cart Item Attribute condition, like shown on image below, since Cart Item Attribute is actually a sales_flat_quote_item table entry field to put it like that. And we said that adding a product with custom option to cart results in sales_flat_quote_item table entry with SKU value of “test_no2-color_green-size_m“. Now lets jump into the code, we will need 3 files to achieve the desired functionality. We basically just needed to add two lines of code for the whole thing to work (you can see those two lines surrounded by “/* @inchoo */” comment). 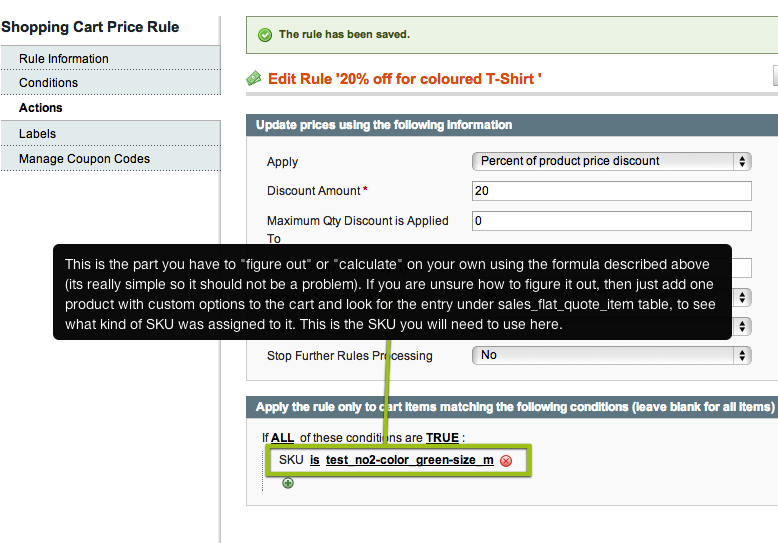 Now if you revisit the Promotions > Shopping Cart Price Rules > Add New Rule, then click on the Conditions tab, select the Product Attribute Combination as first condition then under the next condition dropdown you will see SKU under Cart Item Attribute like shown on the screenshot above. So finally, we can create a Shopping Cart Promotion Rule for Product with Custom Options like shown on the images below. P.S. This example was provided in its simplest form, mostly just to demonstrate a quick “fix” for product custom options rule. More robust solution would be more proper for serious projects. I have this problem, would you be able to make the code modification for me? If so how much it would cost? is there any option in magento 1.9.x to make a sale/promotion for every second/third (every Nth) item ? anyone have this working in 1.9.3 ? It caused my promotion rules setting to be unaccessible, the tabs were there but none of the settings. I had already created the rule and it actually worked but I was not able to access my rule settings anymore and had to delete the the inchoo files to get them back. I have a question that How can I set up shopping cart price rule for each store view? Because Magento default just allows setting this rule at the level of website and apply for all store views. I know there are extensions that can help to do it but is there any other ways to do it? Is possible to associate the rule to just one user instead of a user group? Can we set a condition that some products/categories are not allowed to ship to specific countries? Can we apply 10% discount on all products custom options. it is possible to without “product main SKU”. Thanks! You’re genius. Tried many suggested way from other sites but none worked except this. I use 1.8. Thank you! If u know Can u plz explain me , how to set coupon particular category products if custom option sku is xxxxxx. Great post! Very helpful, thank you very much! In the core, you can see that Mage_CatalogRule_Model_Rule_Condition_Product class extends Mage_Rule_Model_Condition_Abstract (and not Mage_Rule_Model_Condition_Product_Abstract as says Inchoo this class doesn’t exist) but it is not the case of Mage_SalesRule_Model_Rule_Condition_Product which itself extends Mage_CatalogRule_Model_Rule_Condition_Product. 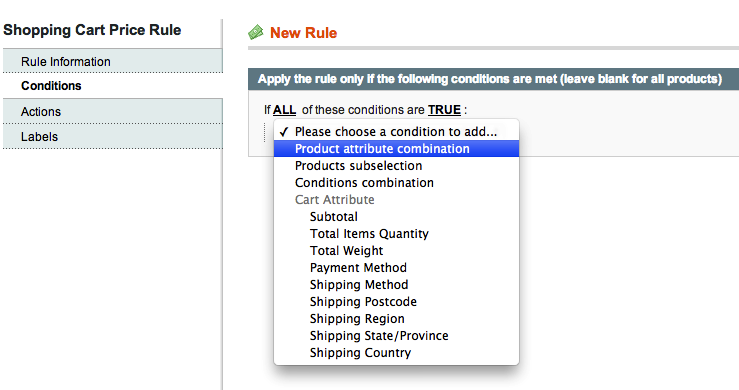 Hello what i meant was that how do you add the custom option that you need for the shopping cart rule? will it be like SKU_customoptionname_valueofcustomoption? You need to go into your attributes “manage attributes” and find the SKU attribute and change it so that it can be viewed in the promotional part. Then under “Frontend Properties” make sure “use for Promo Rules Conditions” is set to Yes. Has this worked for anyone? It isn’t clear on how to add the custom options on the SKU option. This would be a big help. Thanks in advance! Best Tutorial ever! It’s worth to mention, that this also allows for: sku CONTAINS keyword. That is more important to me than: sku IS keyword. E.g., so i can give a discount on every product that has “choco” in its sku, regardless of which product was chosen. I’m not sure if you could help with this, it’s 1.7.02 but its driving me nuts, i’ve setup a promotion, all is working well, and saves, however when i go to the admin, shopping cart promotions, it won’t display, its completely empty in the admin. the page loads, but it doesnt list anything. 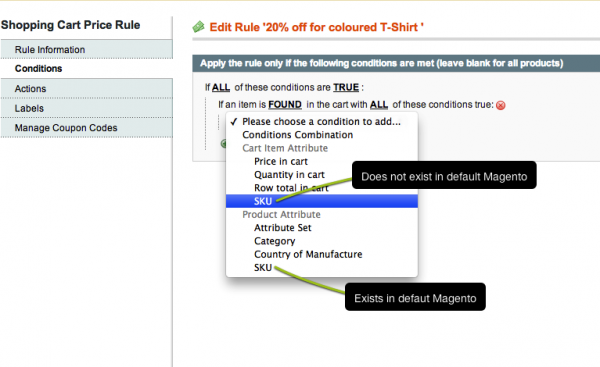 Is not working in magento 1.8. Do you have a solution? How to provide ‘ catalog price rule for product with custom options ‘ ? It’s not working for me.. Always create files according to your instruction but no luck. Can you provide a zip file of code to donwload plz. but , can i add it to catalog price rule . Is there any way to use this formula or this module and make it check for customer ID? 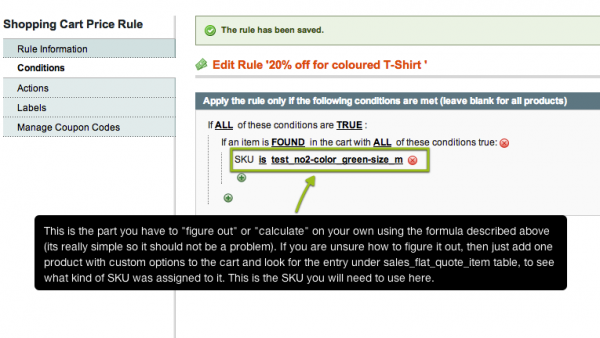 I would like to use the shopping cart rules and check for specific customer ID’s that I will manually input.